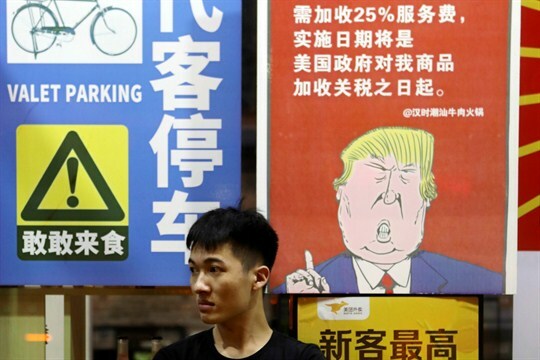 A man sits in front of a restaurant billboard stating that American customers will be charged 25 percent extra due to ongoing China-U.S. trade tensions, Guangzhou, China, Aug. 13, 2018 (Chinatopix photo via AP Images). Since the establishment of the World Trade Organization in 1995, every American president has struggled to some extent with the compromises embedded in the bargaining over the rules of international trade. But that mild discomfort has boiled over with President Donald Trump, who is deeply skeptical of multilateral institutions and has focused much of his ire on the WTO. This is now leading to a situation where the WTO’s system for settling trade disputes could grind to a halt this year. How has that happened, and what would it mean for U.S. interests?